TO DECREASE PRESSURE: Open valve 1 1/2 turns to the right and bleed. INFLATION SYSTEM The valve of the CO2 cylinder is threaded into the coupling nut of the manifold. Since multiplace life rafts are constructed with internal bulkheads, the purpose of the manifold is to provide a com- mon means of directing and diffusing the flow of carbon dioxide entering the rafts inflatable tube chamber. The manifold outlets must bridge the internal bulkhead over which they are mounted. 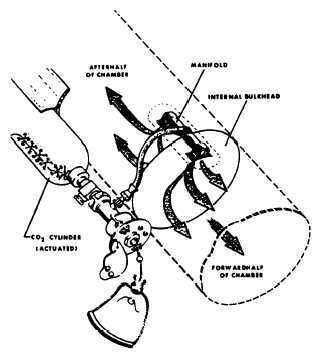 Figure 6-1 illustrates the operation of the rafts CO2 inflation system manifold. All of the exposed metal surfaces of the inflation system that might chafe the raft fabric while packed must be covered with several layers of rubber-coated cloth, and secured with cloth- based, pressure-sensitive tape. Because of space limitation, this chapter cannot possibly contain all of the available information concerning life rafts. The Inflatable Survival Equipment Manual, NAVAIR 13-1-6.1, is referenced for more detailed information. 239.338 Figure 6-1.Multiplace raft CO2 inflation system manifold operation. 6-8 LRU-12/A LIFE RAFT ASSEMBLY The LRU-12/A life raft assembly consists of an inflation assembly (carbon dioxide cylinder and inflation valve) and a four-man raft. Two types of carbon dioxide cylinders and four types of inflation valves are approved for service use. The life raft is made up of a two- compartment main tube; an inflatable seat at- tached to the main tube; a noninflatable floor attached to the bottom of the main tube and inflatable seat; and a sea anchor, which is used to retard drifting. A lifeline, a righting line, a supply pocket, and a combination supply pocket and bailer are attached to the main tube. Boarding and righting handles are attached to the main tube and the floor. Emergency survival equipment and raft accessories, stowed in accessory containers, are provided for the safety and survival of the aircrewmen. The lifeline also provides a means for securing the accessory containers to the life raft. Topping-off valves are located on the main tube and inflatable seat. An LRU-12/A life raft is shown in figure 6-2. NOTE: To makeup the packaged life raft assembly complete with accessories and survival items, all required components not supplied with the raft assembly must be individually requisitioned. The LRU-12/A life raft assembly (droppable) is inflated by pulling the inflation assembly actuating handle, located under the carrying case end flap. The LRU-12/A life raft as- sembly (raft compartment installation) is auto- matically inflated and ejected after the raft compartment door has been released. After boarding, the inflatable seat should be in- flated through the topping-off valves with the hand pump provided in the accessory container. The LRU-12/A life raft assembly can either be dropped to survivors or used by aircrewmen in the event of an aircraft ditching emergency. The raft is stowed in a readily accessible area inside the aircraft fuselage on all applicable aircraft except the S-2 series. Prior to packing any life raft, the assembly must be updated by comparing the configuration of the assembly with the modifications listed in the applicable chapter in NAVAIR 13-1-6.1.